I would like to share a few words with you on behalf of the project. Since my childhood I have been in monasteries where I have been granted almost everything for free. As a token of my appreciation and seeing how important the preservation of Karma Kagyu texts is, I have devoted my time to this great project: to preserve and make them available. For many years I have been working on Karma Kagyu and other texts in the Tibetan language. My motivation behind this project is to serve those who are keen on learning the philosophy, arts and science of the ancient Karma Kagyu lineage not to mention our shared interest in their preservation. Such work should not be prevented by fees and other payments. This project was started in 1999 and the website created in 2006. It has already and will be taking an immense amount of time, because of the vast body of texts of the lineage and my editing alone. 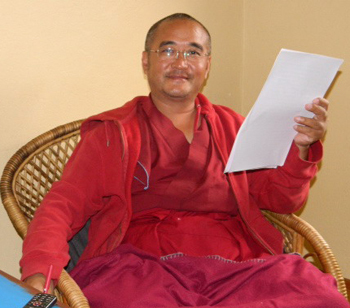 I began my project with the texts that are being practiced at the Karma Lekshey Ling Institute. My thanks go to the students of Karma Lekshey Ling Institute who helped me to type and proof read these texts. I am using the TibetDoc program because I’m comfortable with it. If you don’t have it, you can open the texts with Acrobat Reader as PDF files, in the UDP (UniCode document processor), and in RTF in unicode font and in html as well. If you find any mistakes, please do not hesitate to contact me. This will contribute to improve this project. The various text collections and other information regarding Dharma activities are both in pecha and regular layout. I also plan to offer the puja texts in other languages. I hope this will be of benefit to those who really need it, especially those who are far away from the Karma Kagyu libraries. I am thankful from my heart to the founder of our Karma Leksheyling Institute, the Very Venerable Choje Lama Phuntsok to have established a place where we can work on this project and other Dharma activities. I thanks to the friends who did share thier works with us, I thanks to the sponsors who support to us and I thanks to the sponsors of USB sticks which I can share our whole website until 2015 with others. The parts of the project written in Tibetan are without copyright. Furthermore, I hope that my work will be continued if and when I am no longer able to continue this project.